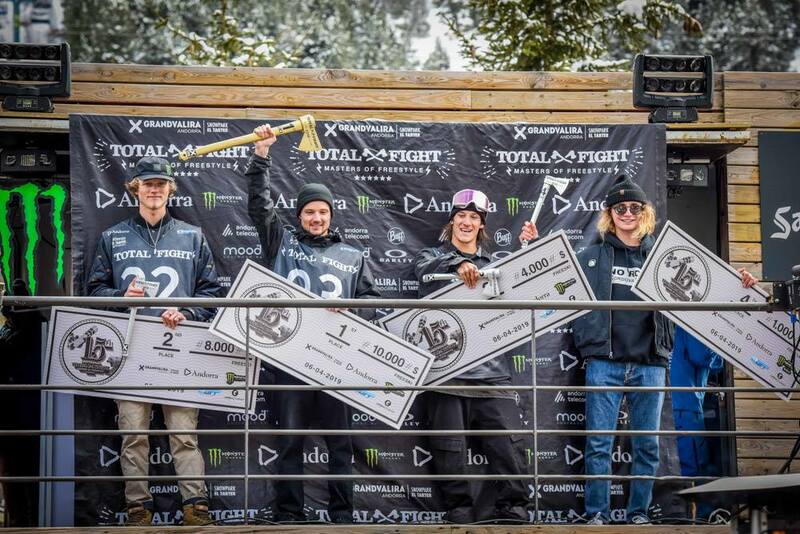 Finn Bilous was one of many top international slopestyle riders to drop in at the 2019 Total Fight. Andorra is a tiny, landlocked nation sandwiched between Spain and France in the Pyrenees, the mountains which divide the Iberian Peninsula (Spain and Portugal) from the rest of Europe. 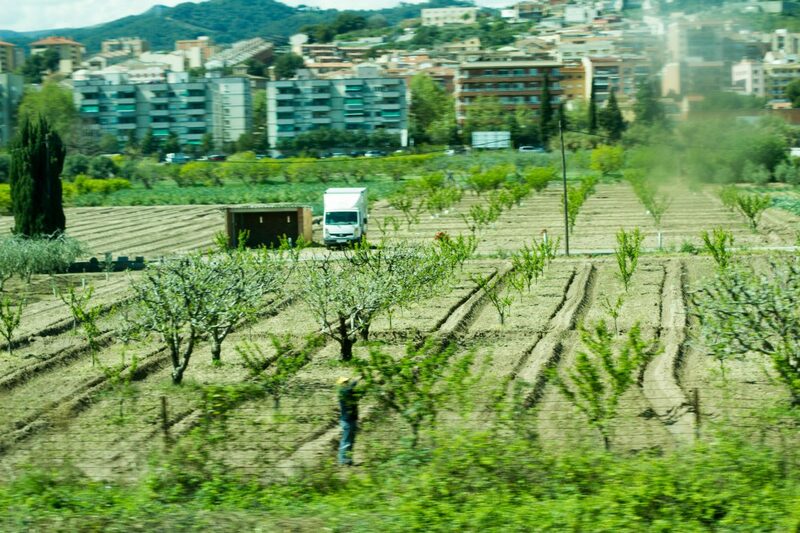 It’s about a three-hour drive to the north from Barcelona through rolling, pastoral Catalan countryside, and about the same distance south from the French city of Toulouse. The ride from Barcelona to Andorra is always a scenic one. The sixth-smallest nation in Europe and the 16th smallest in the world by land area, Andorra has a surface area of 468 square kilometers; this is all straight from Wikipedia. For comparison, that’s a bit larger than the surface area of the city of Venice in Italy, or about a third of the size of the city of London. With a car it takes just over an hour to drive from one side of the country to the other, from the border crossing with Spain, through the capital city of Andorra la Vella—at 1,023 meters of elevation the highest capital city in Europe—up the valley to El Pas de la Casa and into France. The entire country is rugged and mountainous, its various ranges separated by three main valleys in the shape of a Y. Looking up from the bottom of one of these valleys at the snow-covered peaks surrounding you, it’s not difficult to understand why Andorra is a winter haven for skiers. Andorra’s economy is built almost entirely around tourism—around 80% of GDP to be exact, and most of that from winter sports. The rest comes from the banking industry, the country being a well-known tax haven for the well-heeled, with some of the lowest taxation rates in Europe. Andorra: there's no escaping the mountains here. 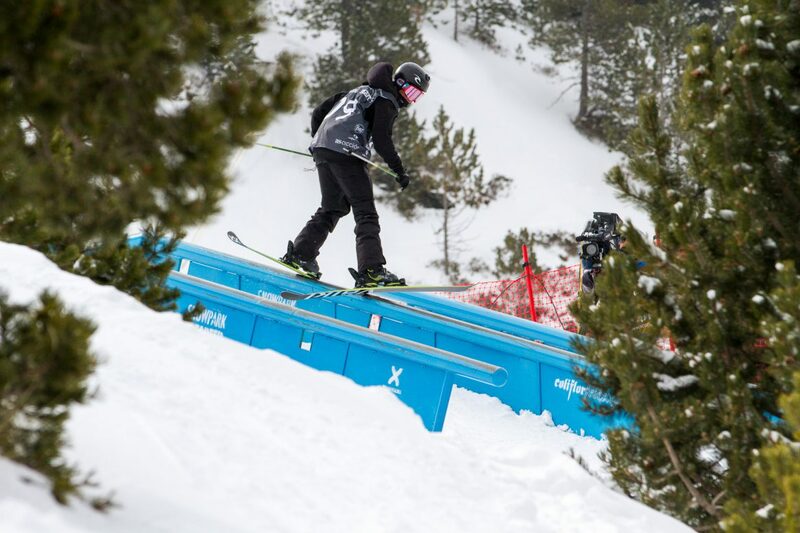 The end result of all this is that Andorran businesses have a lot of weight to toss around when it comes to promoting tourism, which has led to the country attracting many of the top events in the snow sports category. 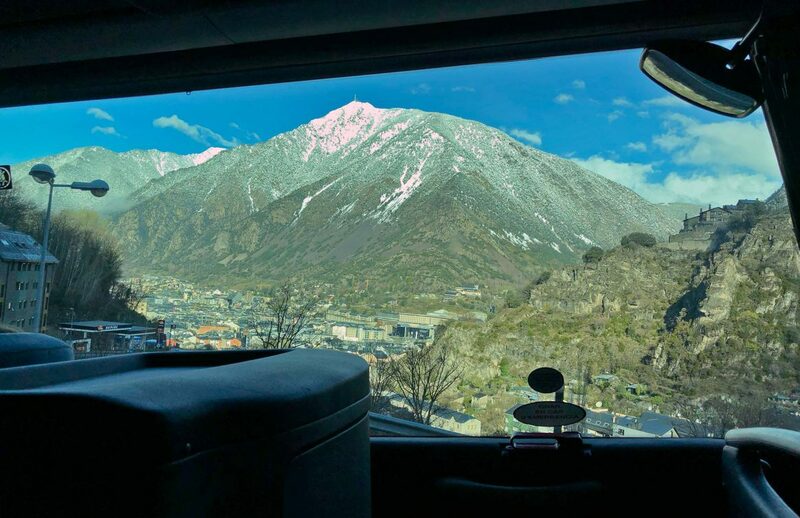 The FIS Alpine World Cup, the Freeride World Tour, even the more core Skier’s Cup and the SLVSH Cup—all have found a welcoming embrace in tiny Andorra. There are also homegrown events like the Total Fight slopestyle—the subject of this article. 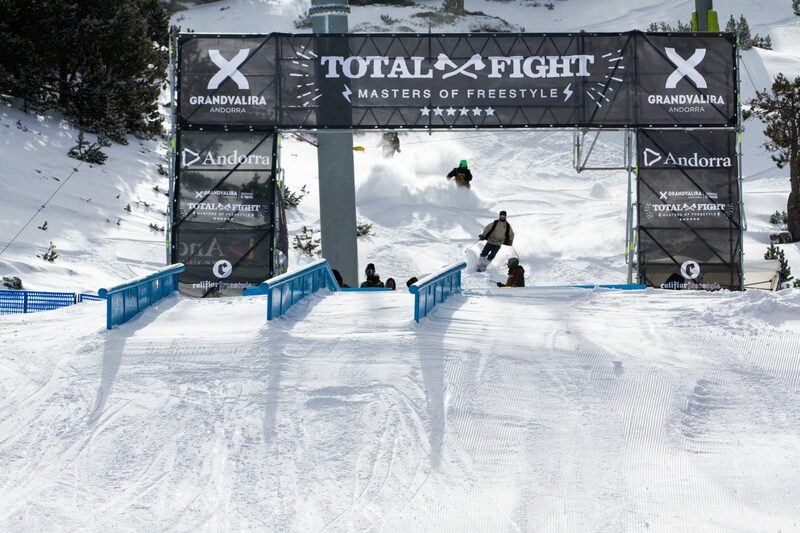 Total Fight is Andorra’s signature freestyle contest and has been around since 2005, making this year its 15th anniversary. That is a long time for an independent (meaning not regulated by the International Ski Federation, FIS) slopestyle contest to be around. Think about other big indy contests that have fallen by the wayside: the SFR Tour, the Austrian Freeski Open or the European Freeski Open. 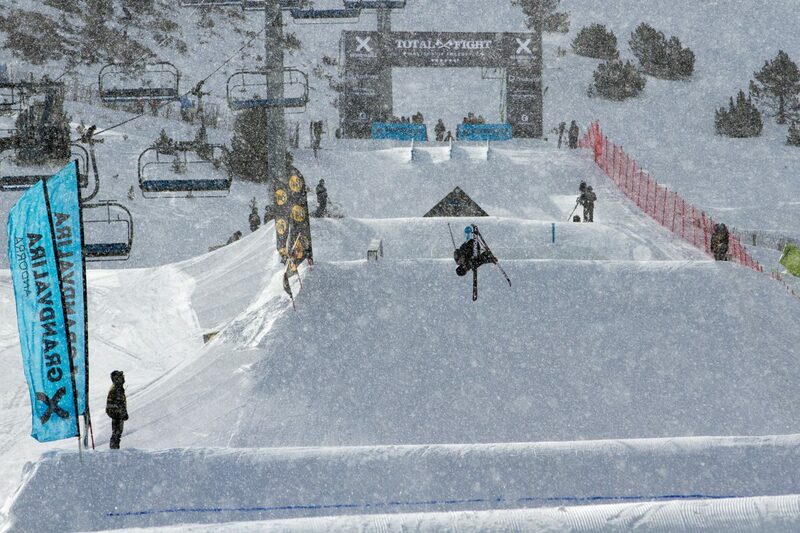 All of these contests, beloved by fans and competitors alike, have slowly disappeared—cornered out as sponsor funding and media attention gravitated towards officially-sanctioned FIS events like World Cups and the Europa Cup. Total Fight is one of the last of a dying breed. This is a non-FIS sanctioned railslide by Thibault Magnin. In its early years, Total Fight featured mostly local riders from Andorra, France and Spain before starting to attract a more international clientele, says event organizer Marc Bajona Carrera. First the Finns and the Austrians started to come, and now a large continent of Americans arrives each year to try their luck. “The first guys from the U.S. were TJ Schiller and Corey Vanular,” says Carrera proudly. “From Finland we had Oskari Raitanen, Kalle Leinonen, Verneri Hannula…” The contest is clearly Carrera’s pride and joy, and he can remember nearly every competitor who’s ever made the journey to Andorra to participate. Of course, the prize money is a big draw: this year it was ten thousand euros for first place, eight thousand for second and four thousand for third, with cash payouts all the way down to 8th place. Carlitos Aguareles Loan holding it down for Andorra. Last Wednesday evening, many of this year’s crop of Total Fight contestants, as well as your assigned Downdays correspondent, gathered in the Barcelona airport to await a chartered shuttle bus to Andorra. In the mix were defending champion McRae Williams of the USA as well as a sizable American contingent including Quinn Wolferman, Colby Stevenson, John Brown, and a grip of young guns like Ryan Stevenson and Peter Raich. On the European front, Ian Rocca was in town from Italy, while Finland was represented by Aleksi Patja and Miika Virkki. 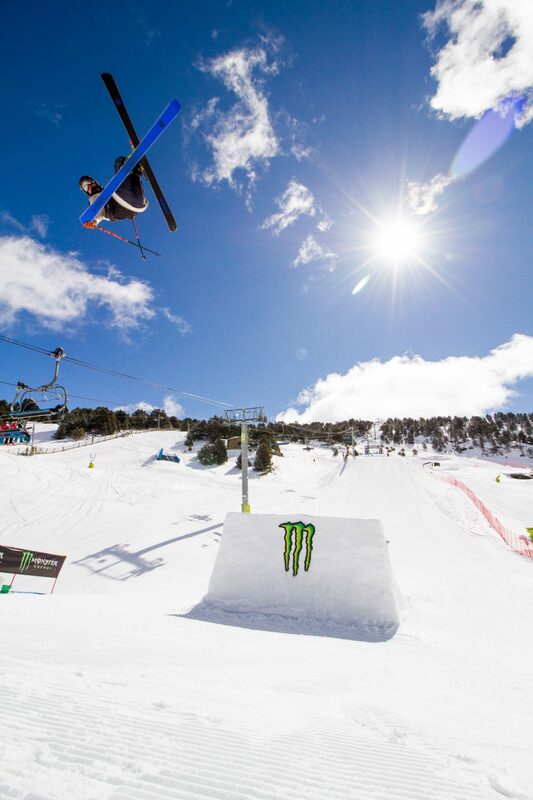 New Zealand’s upstart slopestyler Finn Bilous was in the house, and Swiss heavyweight Fabian Bösch had already arrived in Andorra. After waiting on some delayed arrivals, we loaded up the shuttle for the late-night drive up into the Pyrenees—the undisputed highlight of which was watching an idiotic driver lose control and spin out in spectacular fashion while attempting to pass our bus on the winding, snow-covered road into the mountains. 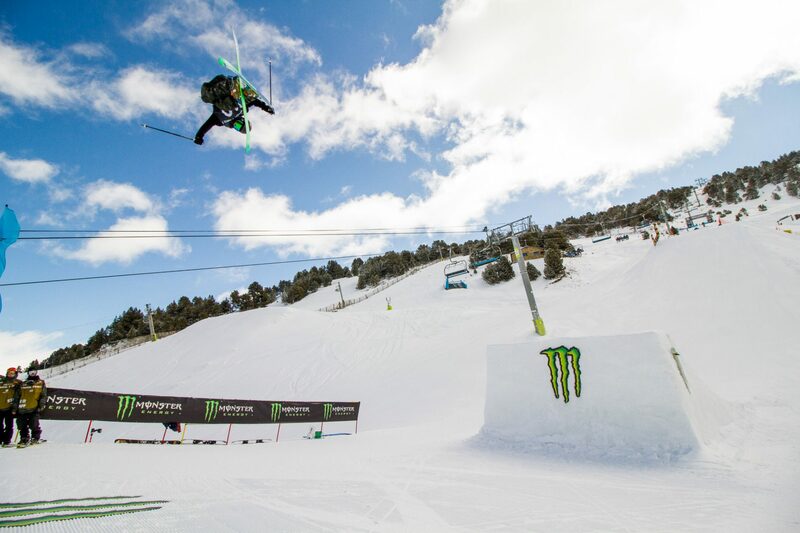 Thursday was training day on the slopestyle course in the El Tarter snowpark at Grandvalira. The nearby snowpark at Peretol, aka Henrik Harlaut Park, home to the SLVSH Cup which is currently dropping games, undoubtedly gets more play in the international media. But El Tarter is actually the main snowpark of Grandvalira—the largest ski resort in the Pyrenees with over 200km of pistes. Grandvalira sprawls across several mountaintops, connecting the resort towns of Soldeu, El Tarter, Pas de la Casa, Grau Roig, Canillo and Encamp. Grandvalira’s trademark is its “X” logo — inspired by two crossing pistes forming this unmissable symbol on the hillside above the town of El Tarter. 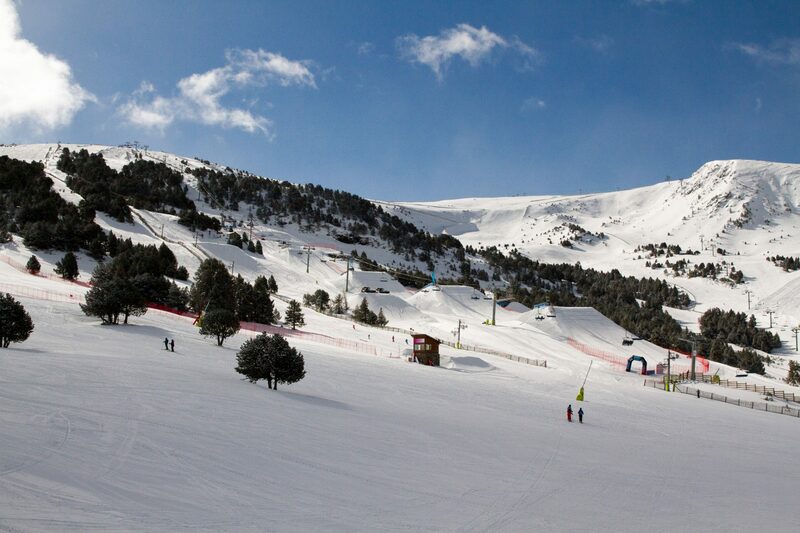 The home of Total Fight, Grandvalira's El Tarter snowpark. 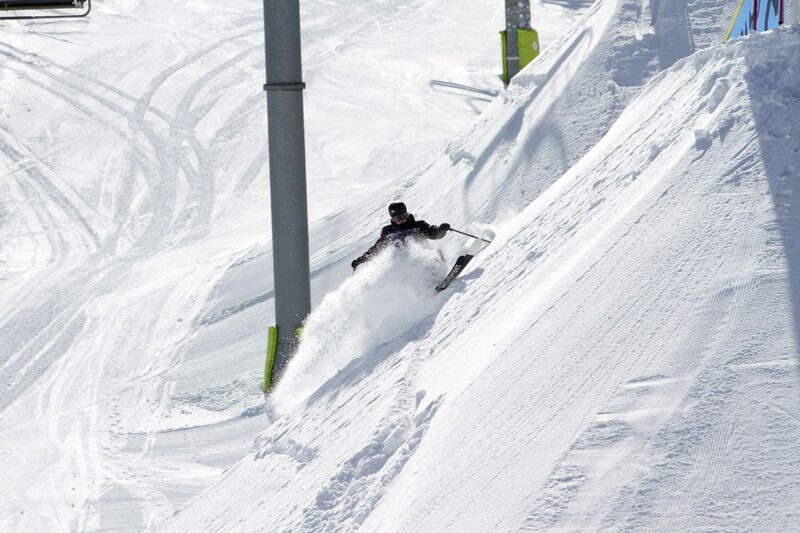 Thursday’s training proved to be the best weather of the week, with sunny skies offering a respite from the wintry weather which had marked the first week of April in Andorra. The field of 22 competitors — all men, as there is no women’s category at Total Fight — took to the course swiftly, having just one day to adapt to its idiosyncrasies before the contest began. The general consensus: a challenging slopestyle, with a narrow margin for error in the jumps. A bit too fast, and you’re going to the bottom; a bit too slow, and you’ll encounter a vicious knuckle. 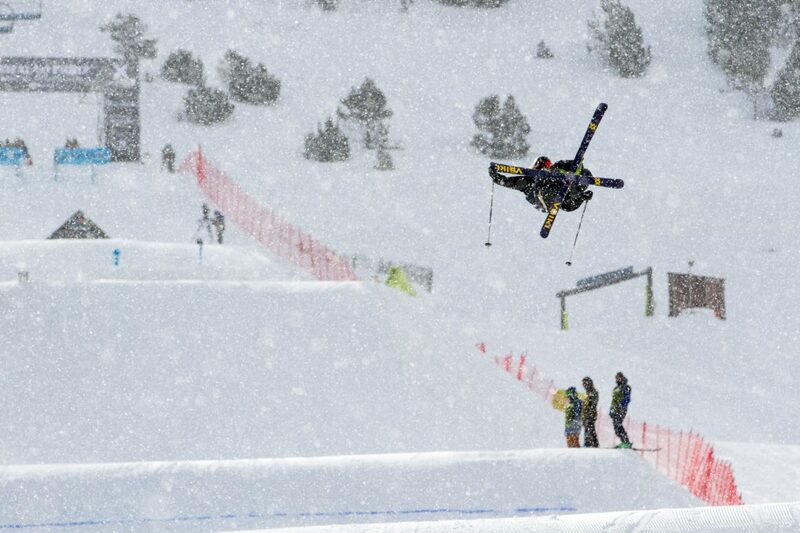 Competitors enjoyed some fresh powder on their way to the slopestyle course on Thursday. While the jumps were getting a reshape, Thib Magnin helped himself to a little powder stash on the side of the knuckle. Total Fight defending champ McRae Williams said he hadn't skied much park lately, but had no trouble laying down this beauty of a cork 5 blunt. Spain's Javier Lliso was a local favorite holding it down with the best of the international crowd. The weather closed back in for Friday’s qualification round, presenting an additional challenge for the competitors as they strived to land a good run and advance to the semis. A clear line began to emerge in the field between the skiers willing and able to chuck double corks in questionable conditions, and those who stuck to their 720s and 900s. At the end of qualis, Fabian Bösch maintained the top position after putting down three different double cork 12s in his run, while Colby Stevenson followed closely in second with a high-class performance in the rail section, including a rightside 270 on backlide 270 out that he’s apparently got on lock, and a blind swap, front 630 out of the up-to-flat transfer that most other competitors awarded. 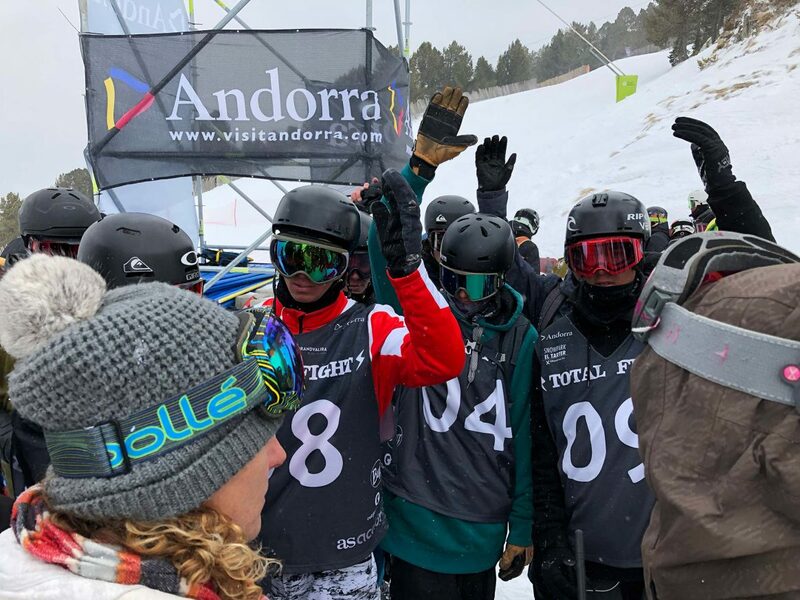 A grab bag of other competitors filled out the top 12 spots, with several riders in the “locals” category, like Andorran native Carlitos Aguareles Loan, Spanish riders Javier Lliso and Thibault Magnin, and France’s Vince Maharavo all advancing. The big surprise was defending champ McRae Williams narrowly missing the cut in unlucky 13th place—but he actually seemed quite content with the result, not being very hyped to ski in the less-than-optimal weather forecasted for the finals. Conditions were... interesting for Friday's qualications. Fabian Bösch braved the elements to qualify first. Colby Stevenson was tight on Bösch's heels in the rankings. American John Brown qualified third with a style all his own. Shooting photos is one good way to see who's always capping their blunts. Finn Bilous is one of those. 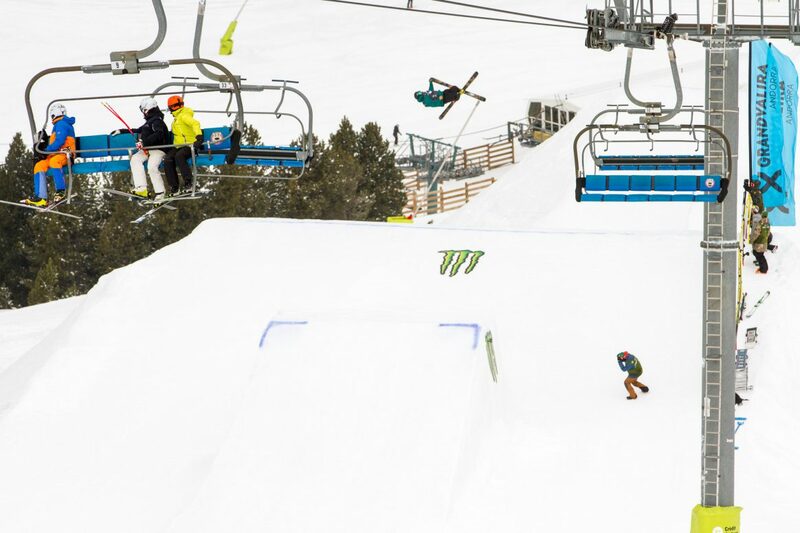 Following the qualis, an interesting scene played out at the top of the slopestyle course, as athletes and organizers held court on whether or not to run the planned semifinals in windy conditions. Total Fight organizers seemed in favor of running the full contest as planned, while most of the athletes who’d advanced—top qualifier Fabian Bösch the most vocal among them—pushing to scrap the semis and go straight to finals on Saturday. “We skied today, put on a great show, so let’s go home and have a good finals round tomorrow,” was the gist of his argument. After a solid quarter-hour of back-and-forth, a final vote was called. “Who’s in favor of running the semis today?” Only two hands shot up: those of American young guns Ryan Stevenson and Peter Raich still ready to throw down, while the rest seemed content with their work for the day. Unlike at some FIS-run competitions, the organizers acquiesced to the riders’ sentiment: semis were scrapped, with the 12 qualifiers ushered directly into Saturday’s finals. Who wants to skip the semifinals? Raise a hand. Saturday, finals day: a fresh dump of new snow, whisked by wind over the slopestyle’s firm knuckles. No one’s preferred competition weather—but even so, a lusty crowd of locals still turned out to fill the scaffolding grandstand set up by Jump 2 and cheer on the courageous combatants. Eventually, even the weather decided to come around, as the wind died off and the sun even struggled to come out, just as finals were slated to begin. Vince Maharavo skied to a respectable sixth place. The improving conditions allowed the skiers to step up their runs significantly in the finals. Fabian Bösch maintained his hold on the top spot with the help of a double cork 1620 double japan in his second of three runs, the biggest spin of the contest. Looking to unseat him, Colby Stevenson unpacked a switch double cork 1440 safety to step up his own run a notch. Stevenson gave it his all on his third and final run, but lost a ski off the lip of the final jump, somehow managing to still rotate a double cork 12 with his lost equipment flying through the air next to him. Even so, Stevenson kept his hold on second place, while Spanish rider Javier Lliso skied into third, cheered on by a hometown crowd, with big spins in the rails and three different 12s in the jumps. 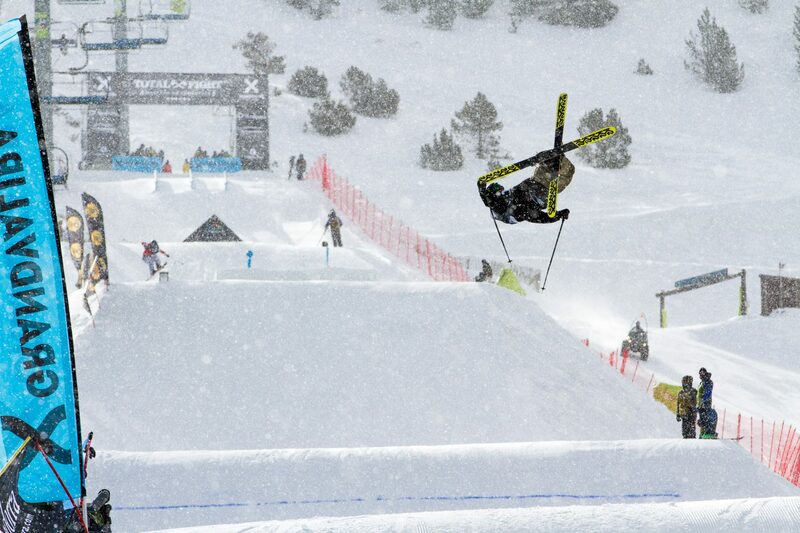 Javier Lliso was the big surprise of the finals, throwing down on his third and final run to capture a podium spot. The competition concluded, your Downdays reporter indulged in a few powder laps with Spanish freeski OG Pako Benguerel, who happened to be celebrating his birthday, and several of the competing skiers. After making the most of a few fun runs, the squad headed down to Grandvalira’s apres-ski hotspot, the L’Aberset bar, for the awards ceremony, where Bösch accepted his ceremonial victory hatchett—the third he’s been given already this spring. 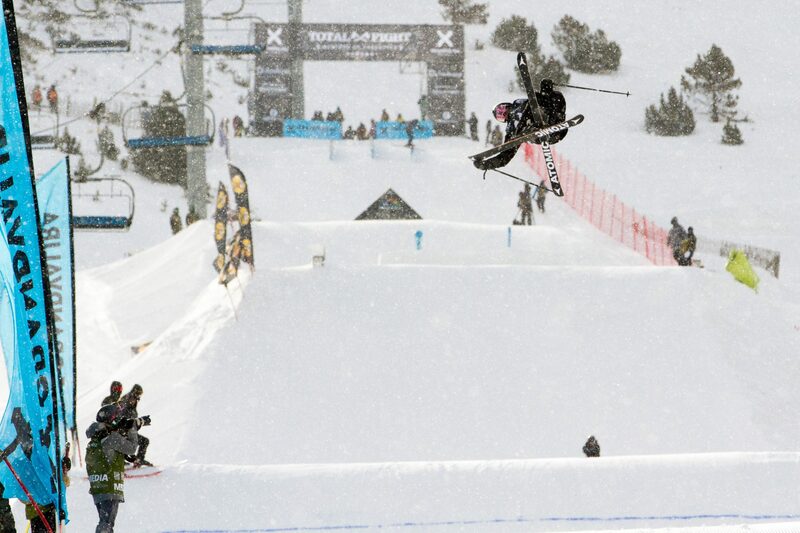 “I didn’t get a lot of good results in slopestyle this year, so I’m really happy to take the win here,” he said.